Difference between revisions of "Deadbush"
Deadbush Northeast Airfield finishes construction. The town was founded on April 6, 2018, five days after MojangChan was granted Member status, in a relatively flat piece of Mesa land. 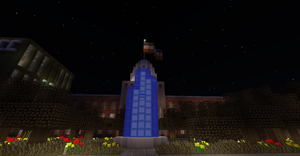 From there, the first building in Deadbush was built, the Pioneer Building, as well as the City Flag being planted in front of it. The road grid was then built along with the initial four checkpoints or entrances to the city namely Pioneer, Pond, Isthmus, and Foothills. The first business of Deadbush, Stone Bank, as well as the residence of MojangChan. The fist problem that was encountered was how Deadbush was built a bit too near to Heampstead. To resolve the problem, Deadbush agreed to not build further northward and the border for expanding west of Deadbush was set at the Kel Line beside a grocery store of its namesake. Deadbush was given Southfields by ModernArt through the Annexation Act of April 22. This act states that "Southfields is now a part of Deadbush in accordance with the agreement that Deadbush would take Southfields as long as MojangChan allows ModernArt to be the district mayor of the said district." This act resulted in Southfields annexed and made part of Deadbush. This also resulted to the creation of two more districts, Valley and Middelhoog, due to the distance between Deadbush (when it was only the Pioneer District) and Southfields. When Deadbush acquired the New Territories, there was a need to close the gap between Deadbush, which consisted only of Pioneer at that time, and Southfields. The first thing that was built in this gap was the Deadbush Grandstand and the Union Building, the headquarters of city parliament. A few franchises were then built such as eGadget Electronics and LocalMart. The next "big-thing" was then built which was Deadbush Centro Station, the city's first intercity rail terminal. After that came the city's first skyscrapers which congregated into the Deadbush Central Business District. Valley District paved way for high-rise residential flats, making it the most densely populated district in the city. 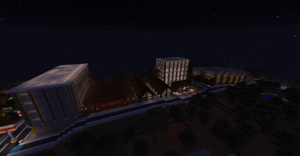 Soutfields expanded North and sprouted up the Southfields Convention Center and Zuidmart. This age of rapid urbanization spanned across the Councillor and Mayor periods of Deadbush. 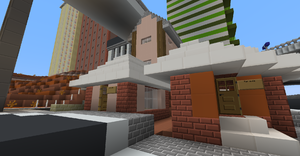 Pioneer District is the first district to be created in Deadbush. It is located in the foothills of the Nord Plateau (where the IntraRail track is located). It is home to the headquarters of several businesses based in the town such as Stone Bank1 and Chan Industrial. Many foreign franchises, both along Union Avenue and in the Arcadia Shopping Mall, are located here. Notable ones include Space's Ice Cream Stand and Richville Metropolitan Bank. 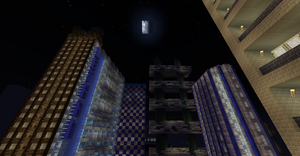 The embassy of the United Dominions of Megaton, a town in the InfiniteHeights server, is also located here. Pioneer District with Stone Bank Call Center, Colbydance HQ, and Chan Industrial HQ in background. Valley District is a very rugged district created along with Middelhoog and Southfields districts through the Annexation Act of April 22. It is located between the Nord Plateau and the Zuid Plateau (where Middelhoog and Southfields are located). Among the four districts, it is the smallest in terms of land area. It is home to a few houses built by frogggggg. Recently, it has urbanized in a rapid pace with high-rise apartments like the Harrison Flats and the Brixton Residences, and some more houses, which made the district become the most densely populated in Deadbush. Harrison Avenue, a notable low-income neighborhood. Like Valley and Southfields, it was created through the Annexation Act of April 22. It is located in the Zuid Plateau, along the Chan River. Among the four districts, it is the largest in terms of land area. It is home to the Deadbush Grandstand and the Union Building, both are located in Centro Square. It is also home to the Deadbush Central Business District, the financial center of the city, which serves as the headquarters of many big companies based in the city such as QMEU Telecom and Stone Bank. It is also home to the Deadbush Centro Station, the main railway terminal of the city, which will be soon served by Manukau Trains and P&D Railway in the future. Notable franchises here include Le Tran Gas Station, RichPlus Fuel, eGadget Electronics, and LocalMart. Southfields is a town-turned-district formerly owned by ModernArt ceded to MojangChan through the Annexation Act of April 22. 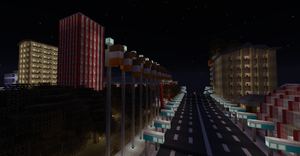 The district is unique as its road design and buildings are different compared to the rest of Deadbush. It used to have a left-hand side driving policy but switched to integrate with the other districts. 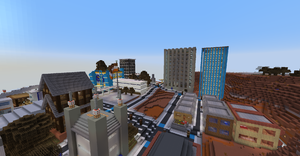 Notable buildings here include the Deadbush Courthouse, the headquarters of the Deadbush Judiciary Branch, the Southfields Convention Center, and Zuidmart. New Manila is a district west of Middelhoog. It is home to the first municipal agencies of the city namely the Municipal Housing Agency, the Municipal Infrastructure Agency, and the Municipal Employment Agency, as well as the Place des Quartiers, the headquarters of the Council of Districts. It is also home to New Intramuros, a neighborhood inspired by the architecture found in a Spanish pueblo. Within this pueblo houses the University of Deadbush, the flagship university of the city, Deadbush Palengke, a flea market that sells very-low-priced goods, and the Volkerreserve, an urban farm and food storage that anyone can use. Asulton is a district occupying the southwest portion of the city. It is home to the Deadbush I.T. 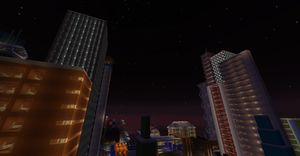 park, an extension of the Deadbush Central Business District which houses the headquarters of companies like Damasony Electronics and Le Tran Oils. It is also home to the Freeman's Ward, a shanty town confined to a single city block, and Berlin Residences, a neighborhood composed of German-style houses. Municipal agencies located here include the Municipal Transport Agency and the Municipal Intelligence Agency. Oaksburg is a district located on the northern side of the Zuid Plateau. It is the least built-up part of the city as there are plentiful oak trees that hinder buildings from being constructed. It is home to the headquarters of the P&D Railway and the Municipal Foreign Affairs Agency. It serves as the starting line of the NASKart track, Deadbush Heights. Notable franchises here include niccoffee, Quill & Ink, Inc., and Foxfoe Chemical Factory. Oaksburg District. Due to the large amount of trees, only about half of the district is occupied. The Pond Suburb of Titsensaki is an exclave owned by Titsensaki surrounded on three sides by Deadbush. It currently houses a municipal hall, three buildings, a commuter station, an under-construction metro, and a small army base. 5 District Mayor of Middelhoog / Overseer of Deadbush C.B.D. 9 District Mayor of Blackwater / Overseer of Deadbush Lower B.D. Annexation Act of April 22 / Act 1: States that "Southfields is now a part of Deadbush in accordance with the agreement that Deadbush would take Southfields as long as MojangChan allows ModernArt to be the district mayor of the said district." Annexation Act of May 31 / Act 2: All land south of the Pond Suburb of Titsensaki until the limits of Southfields is now part of Deadbush for the purpose of 1) To make the city more "proportional" and 2) Increasing lack of space. Municipal Infrastructure Agency Resolution 1: All end-rod border fencing will be demolished except for the area surrounding P.O.S.T. Municipal Transport Agency Resolution 1: Track reservations in Deadbush Centro Station will be made null for the following railway companies due to no stated time of construction and to prevent the said station from abandonment. Southern Border Treaty / Act 3: Usage of border between mesa and desert as border for Deadbush/Valletta when expanding south/north. Approved by mayors of Deadbush/Valletta, MojangChan/AEhub. Western Border Treaty / Act 4: Usage of western side of Zuid Plateau as border for Deadbush/Borderville when expanding west/east. Approved by mayors of Deadbush/Valletta, MojangChan/Foxfoe. ModernArt Ban/Act 5: The said person is banned from building ANYTHING in Deadbush due to the said person's apparent lack of commitment and short attention span in completing a single project he starts. In other words, to prevent project abandonement Conditions: (1)The demolition of NewRail track in Southfields. (2)The reversion of NewCommuter Deadbush back to the P&D Railway. (3)Expansion plans of [NewRail] shall be handed over to the Municipal Transport and Infrastructure agencies. (4)Getting fired from the role of district mayor of Southfields, making him stripped off from his building rights for the said district. Municipal Infrastructure Agency Resolution 2: In response to Act 5, the Municipal Infrastructure Agency approves the demolition of the elevated U-Turn located above Cirque District, and the at-grade track located in Southfields. Municipal Transport Agency Resolution 2: In response to Act 5, the Municipal Transport Agency approves the banning of NewRail from serving Deadbush. 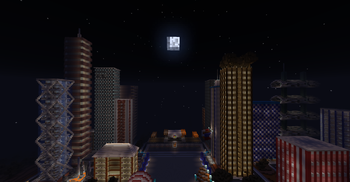 1 Stone Bank's headquarters has been recently moved to the Deadbush Central Business District. The former headquarters is now a call center.